I must be mad, I know, let's just admit it right now. These "parties for no reason" are getting out of hand, with TWO these last school holidays. I was kind of hoping Scrag would forget my mumbled agreement to have a Star Wars "party" for him and a few Jedi pals, but on the last Wednesday of the hols, he came up to me as I sat at the computer pinning things and asked so sweetly: "Mum, shouldn't we be getting ready for the Star Wars party already? Shall I get my notebook so we can start making plans?" In my defence, I am rather powerless against the heartfelt pleas of my young Jedi when he asks so nicely (and hugs me so much). The Force is strong with this one. What could I do but start searching for Star Wars ideas? 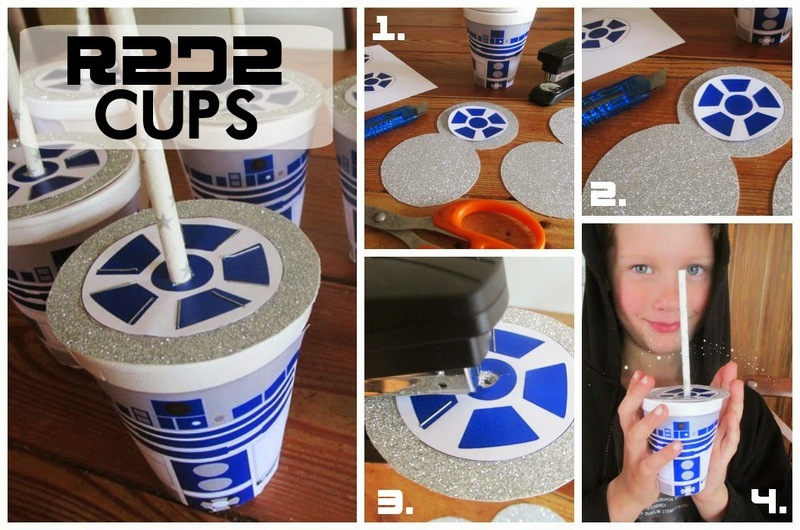 Trim and stick the R2D2 body onto the styrofoam cup using a glue stick. Trace circles on the back of silver card to form a lid. Carefully cut out the circles. Cut a small cross with a craft knife in the middle of the circle to poke the straw through. Cut out the round lid printable. Use a hole punch to punch a hole in the centre circle of the lid printable (or carefully cut a small circle). Staple the lid printable to the silver circle, letting the staples line up with the edges of the blue printed shapes. Poke a straw through and Voila! 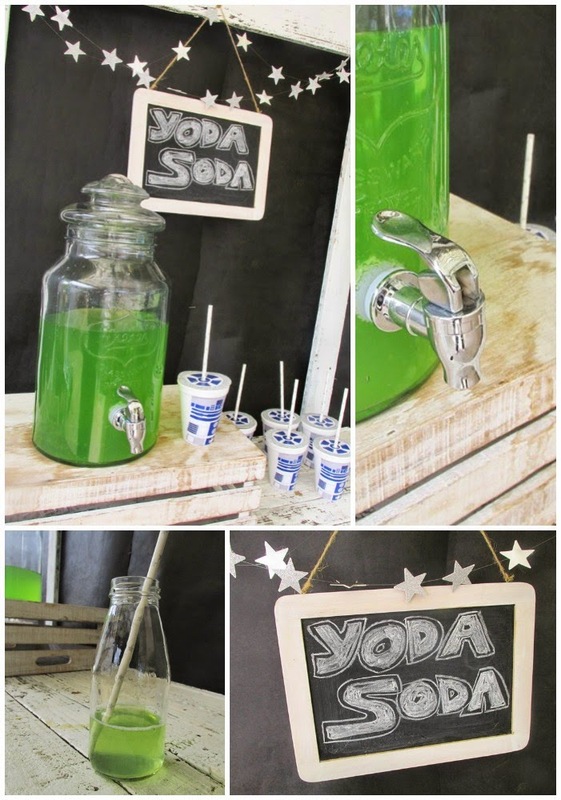 An R2D2 cup perfect for your impromptu Star Wars Party! 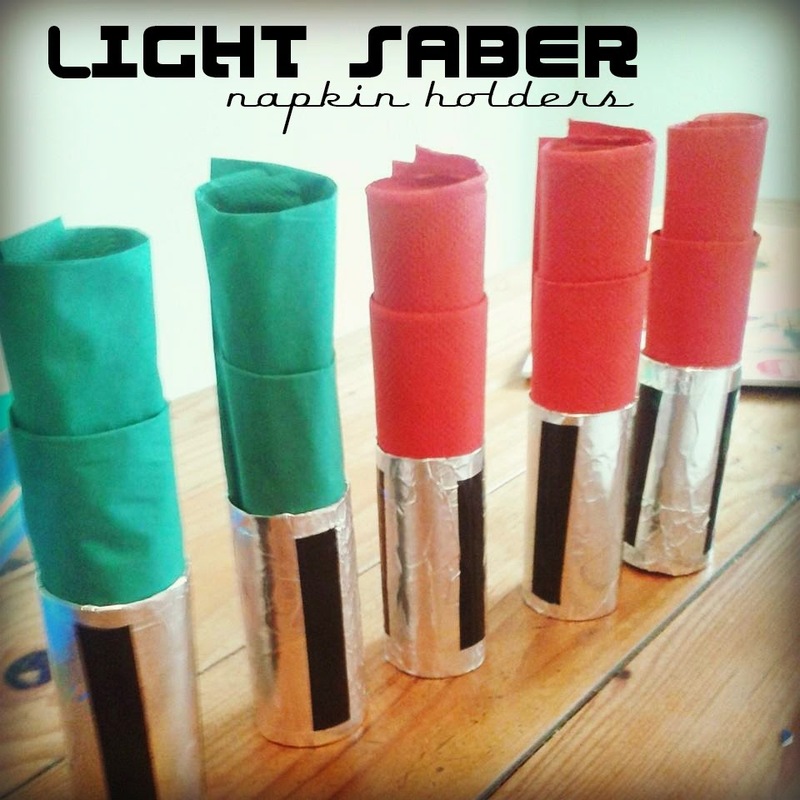 I've made these Light Saber Napkin Holders before (and had been collecting toilet rolls for weeks). They are easy to make, by covering cardboard toilet rolls with silver duct tape and adding black electrical tape details. (Or you can paint the toilet rolls black and add the duct tape as detail). We have been mad keen Star Wars enthusiasts since forever. We've had a Star Wars Birthday Party (for Dash), a Star Wars Theme dinner and a May The Fourth (be with you) Star Wars night for a bunch of eight and nine year olds. In our dressup box lurks a Darth Vader talking helmet and a Princess Leia wig, so pulling off a Star Wars party with two days notice was really a doddle, especially with the most enthusiastic six-year old Jedi helper EVER. 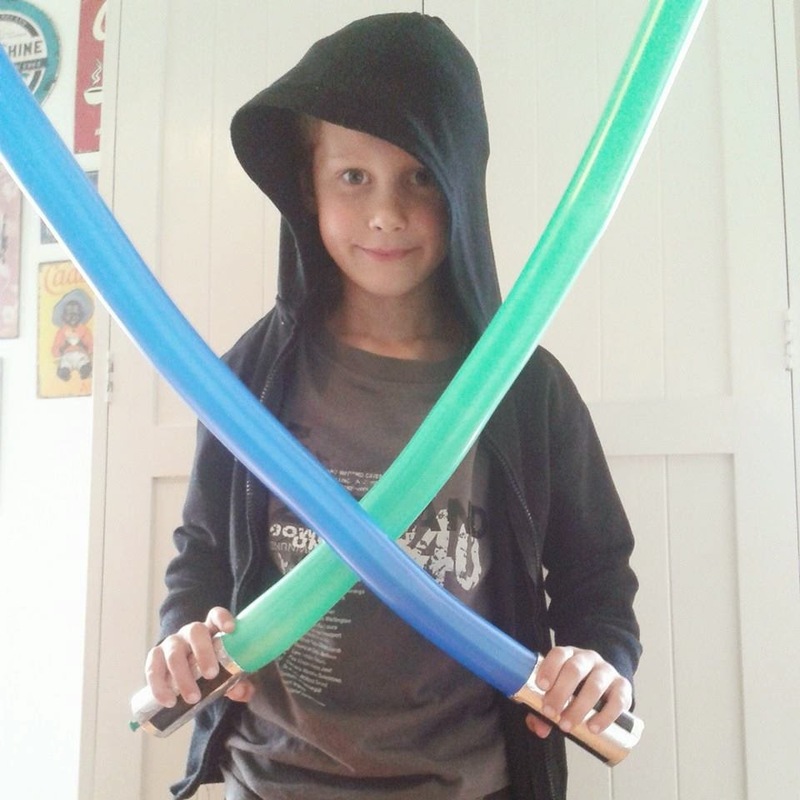 We made enough light saber handles from toilet rolls to make balloon light sabers as well. Such a pity that the $2 shop balloon pump broke after we just blew up these two balloons. I guess you get what you pay for aye? (You can bet we protected these two beauties from all comers until it was time to do battle). I was a bit bummed but my young padawan told me, "Mum don't be worried because look at all the OTHER amazing things you've made! Fear leads to anger. Anger leads to hate. Hate is the path to the dark side..." Someone's been listening to Yoda. This is such a simple idea, cost NOTHING and was so effective. Building paper, staples, chalk. Easy! Our young Jedi trainees guzzled this down like they didn't know it was good for them. Yummy! Last week of the school holidays, not many of his buddies were in town, so just three young Jedi were due to turn up to play. 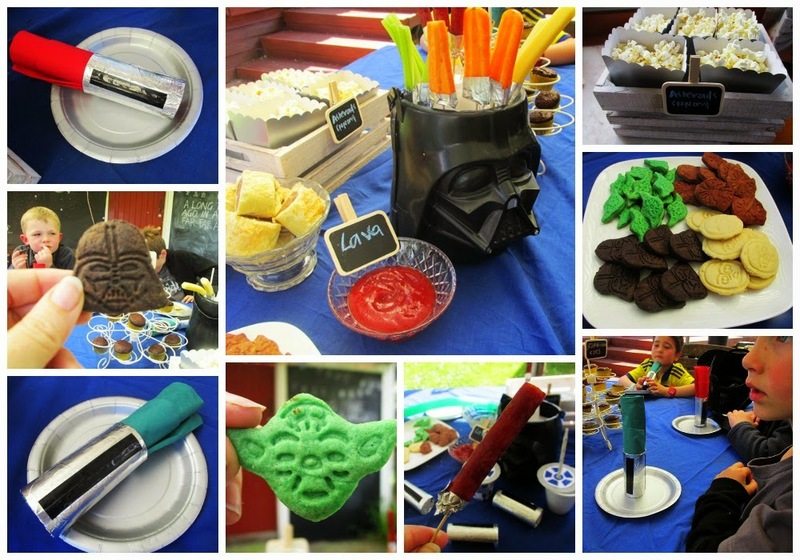 Really, this was a themed afternoon tea, with light saber battles thrown in. But Scrag loved it and appreciated all the little touches (he kept hugging me and saying, "Thankyou mummy, I love you" "Mummy you're the best mum ever!" It made it all worth it). 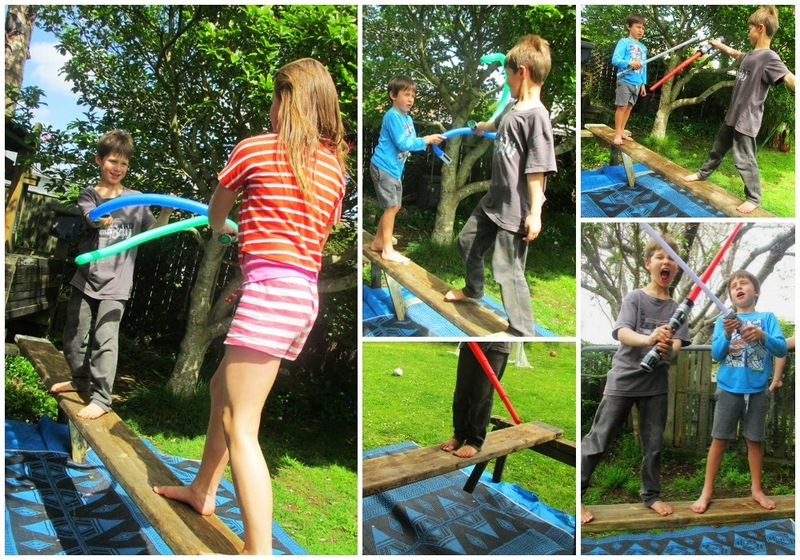 I set up a beam for them to have light saber battled on, a plank of wood supported by two sawhorses. Underneath was a homemade fall-mat. A tarp, spread with flat cushions/squabs, with our large woven mat spread on top. Nobody seemed to mind falling. 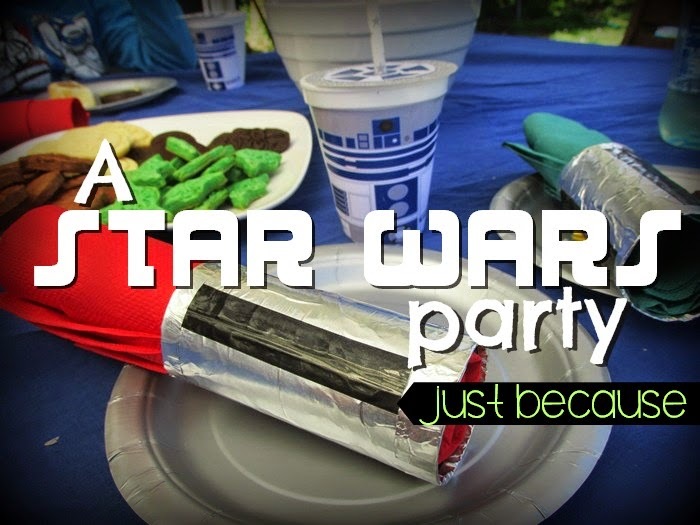 Of course if this were a "real party" I would have planned all kinds of fun star wars games and activities. But this was a glorified group playdate on a theme with a special afternoon tea, so I left them to come up with their own fun. The cookie cutters come in a pack of four, C3PO, Yoda, Chewbacca and Darth Vader. I found mine on TradeMe, but you can find them all over the internet and they are cheap as chips ($6.95 for the set). We divided the dough into quarters and added colour for each shape. C3PO: Just cut out the dough, as is. No colouring required. 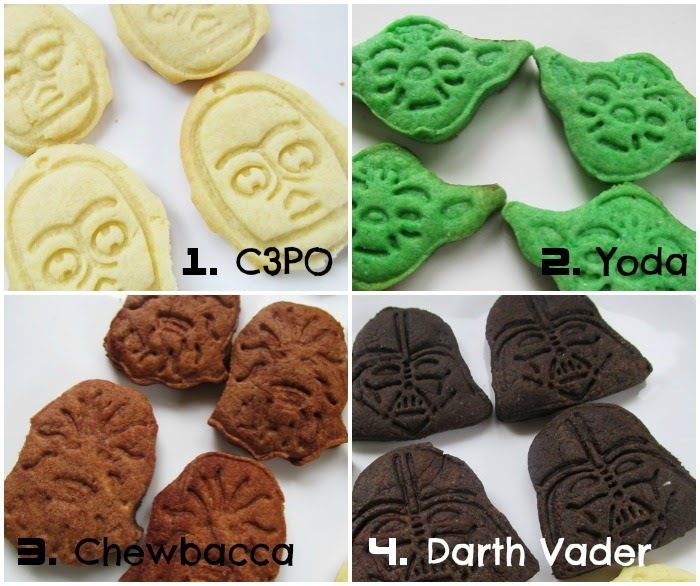 Yoda: Add a splash of green food colouring to Yoda's quarter of the dough. Chewbacca: Add 2 tablespoons of cocoa powder to Chewie's dough to make him nice and brown. Darth Vader: Add cocoa powder PLUS black food colouring to make Darth dark, as he should be. Oh dear. Are we coming to the end of our birthday party years? NOOOooooo!!! See why I have to squeeze in these parties for no reason while I can?